Review Audiocore WCS-1000 Wireless Conference System dari USA-Brand Audiocore! Audiocore WCS-1000C merupakan Unit Mik Pimpinan untuk Sistem Konferensi Wireless Audiocore WCS-1000. Menggunakan teknologi wireless digital terbaru, Audiocore WCS-1000C mampu menangkap sinyal sampai dengan 80m wilayah cakupan sinyal yang optimal dan masih mampu untuk menjaga hasil kualitas suara yang sejernih kristal. Mik Ketua rapat ini memiliki tombol fungsi prioritas yang mampu menonaktifkan mik anggota dengan sekali tekan untuk mengontrol jalannya rapat. 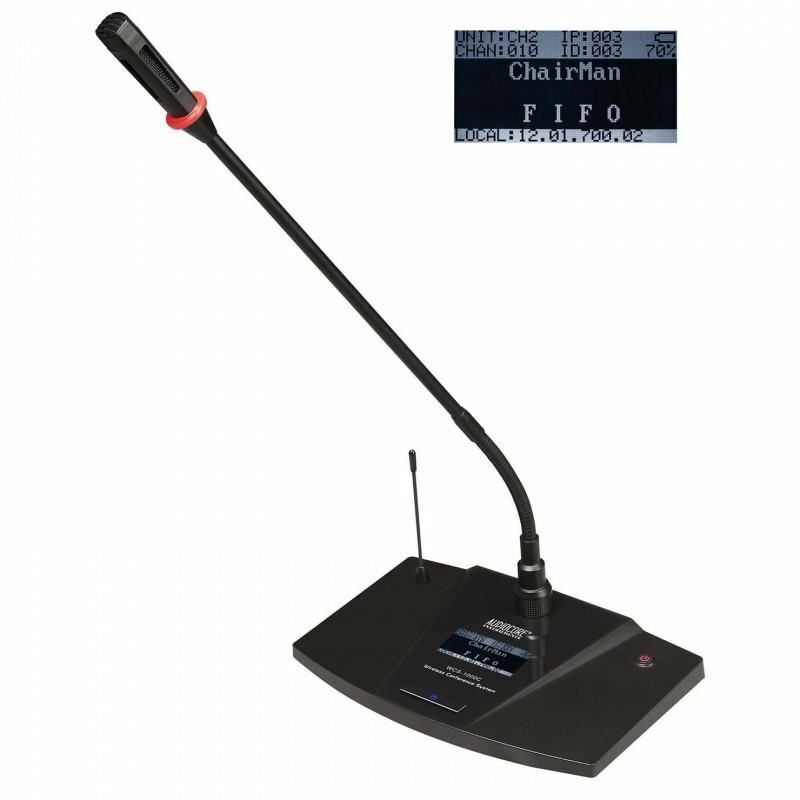 Audiocore WCS-1000C is the chairman microphones unit for the Audiocore WCS-1000 Wireless Conference System. Using the latest wireless digital technology, Audiocore WCS-1000C is able to receive signal up to 80m optimal coverage distance while maintaining crystal-clear vocal quality. This Chairman Microphones have priority function to mute all delegates microphone at a touch of a button to control the flow of the conference. Krezt MC 8UN Conference Discussion Microphone SystemSpecification System :Frequency range : VHF 190-270MHzAudio frequency response : 50Hz – 15KHz ±3dBDynamic range : =95dBS/N : =85dBOperating range : >30mAmbient temperature : -10C to 55CTransmitter :Frequency stability : ±0.1RF carrier power : 10..
Sennheiser EW 122P G4Generasi keempat dari evolusi nirkabel membuat teknologi nirkabel profesional menjadi lebih fleksibel dan lebih mudah. Untuk musisi, pembicara Sennheiser G4 microphone sangat ideal untuk kebutuhan Anda.EW 122P G4-G mikrofon yang sangat cocok untuk presentasi, karna pada transmit..
Shure SVX24/PG28 Handheld WirelessThe Shure SVX24/PG28 is a wireless vocal system that includesFeaturesSVX4 Diversity ReceiverSVX2 Handheld Microphone TransmitterPG28 Microphone..
Sennheiser e-905 Mikropon Snar DrumCardioid e905 memiliki SPL maksimum tinggi dan respon transien yang sangat baik, cocok untuk berbagai instrumen dan pilihan ideal untuk drum snar.FiturSuara yang mengesankan dan penuhSerangan sangat cepatTubuh mikrofon pendek untuk memfasilitasi penempatan yang opt..
Line 6 XD-V75 Professional Digital Wireless Handheld MicrophoneFeatures:Professional digital wireless system for performing vocalistsLicense free operation worldwideExclusive microphone modeling technology gives vocalists a choice of 10 superb microphone models based on the world's most popular mics..